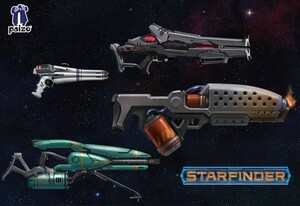 Sounds to match up with every handheld weapon in the Starfinder Core Rulebook. Small, long, heavy and sniper builds of every energy class of sci-fi weapon you could want. Pew pew! Plus light and heavy conventional firearms too, in case you want to Pow pow as well!